Note: This is the second article in a two-part series on diving boards. 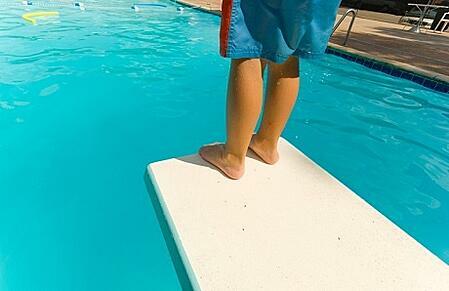 For part 1, “Swimming Pool Diving Boards: Consider Safety, Usage, and Backyard Size,” click here. After considering the important issues of diving safety, board usage, backyard size, and maximizing your family’s recreation, you’ve decided to include a diving board with your new swimming pool. Your next step is choosing what kind of diving board will provide the best overall fit for your needs. Three main categories of boards—each with attributes that impact anyone jumping from it into your pool—are available. 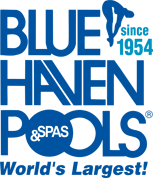 They come in a wide mix of shapes, sizes, and levels of “springiness.” It’s also important to know that board types are not alike: You cannot interchangeably use each of them on all pools. In fact, certain ones may not be appropriate for the size and configuration of your particular pool or the swimmers using them. Indeed, most pool buyers are unfamiliar with the specifications for safely matching board types to pool dimensions. That’s why it’s a good idea to educate yourself about the key differences between board types, and it’s the primary reason why you should always have a pool professional handle the board installation. In addition to your pool dimensions, who will be using the board should also factor into the kind of diving board you choose. For example, some small children with access to your pool may not have the balance and coordination needed for diving off a particularly springy, flexible board that provides extra bounce. For different reasons, a board that’s not flexible also might be a better choice for divers who are particularly tall and athletic: Those with taller statures or stronger diving skills can propel themselves higher into the air and further out from the board. With a longer travel distance, divers could face greater odds of coming into contact with the pool bottom. Again, a pool professional can advise you on the type of diving board that will offer the safest match between your family and friends and your pool’s configuration (such as the pool’s diving-well depth and the graduated slope from the shallow area to the deep end). Let's take a look at the three primary kinds of boards and platforms available for residential pools. First, keep in mind that a board consists of two key components: the horizontal board and the base upon which the board attaches. Why does that matter: Because each component brings different characteristics to the final unit; the result will depend not only on the horizontal board itself but also on its base. How the two work together will provide varying levels of bounce or springiness. Boards offer individual levels of flexibility and resulting bounce. So do the bases or platforms, which may be rigid and stable or feature a spring mechanizm that increases bounce. To help understand the level of bounce that comes from the various board and stand pairings, diving board manufacturers provide recommendations for their products. These specifications indicate which boards you can combine with which bases, and they list the resulting amount of flexibility the combination will provide. To illustrate how these combinations can work, here is a chart from one diving board producer, S.R. Smith. It ranks various combinations in how flexible (or bouncy) each is. Here is a quick overview, along with definitions of the three diving boards categories. From bounciness to aesthetic appeal, each one differs in its characteristics. A “diving platform” represents a different kind of launch pad for entering the water from what most people think of when picturing diving boards. This version is a rigid, non-flexible board that rests on a rigid stand. What’s key about diving platforms is that they provide virtually no spring or bounce. For this reason, many consider a platform the safest form of diving structure. That’s because giving divers a greater capability to bounce with greater force—which a platform does not do—increases the horizontal distance they might travel. That boosts the chances they could hit a pool wall or the floor and get injured. This trait makes a platform unit a good choice for divers who do not want—or should not have—extra thrust propelling them into the water. A platform can also be appropriate for some pools that are large and deep, but that lack the specific dimensions and configuration—such as graduated slope and size of the diving well—required to accommodate a true, bouncy diving board. An attractive twist on the traditional diving platform is what’s known as a jump rock. They come in a variety of shapes and sizes. 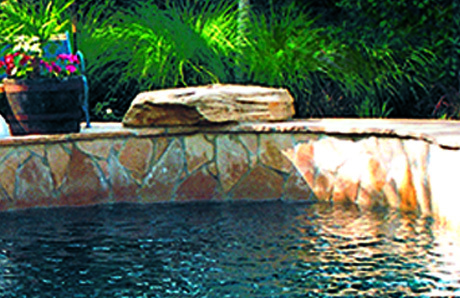 Most pool builders create this kind of platform using natural stone; jump rocks are also available in man-made materials that simulate natural rock. Along with their simple functionality, jump rocks add a decorative touch, particularly for natural-style pools with rock waterfalls or tropical planter boxes. Note: Platforms and jump rocks are primarily intended for jumping. Never dive off one that’s placed above pool water that’s less than 8 feet deep. 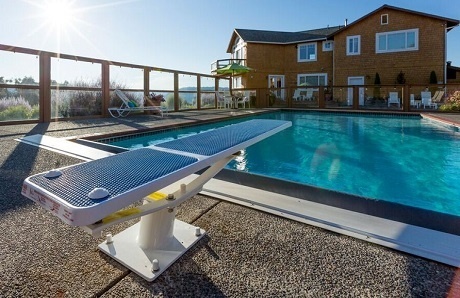 The generic term “diving board” actually refers to a flexible board on a rigid stand. The flexible board may be aluminum or wood that’s coated with fiberglass or composite material and textured with a slip-resistant finish. The rigid stand is static and offers no spring. However, unlike a stable diving platform (described above), the flexible board itself does provide a small amount of lift or spring for divers. Now, more springiness can be more fun. However, the added bounce is important to weigh for your family needs and those who will be using the board. Using a springy diving board should also prompt even greater awareness of safe-diving practices. The jump board’s stand has a pair of opposing-force steel springs to create spring. The stand works in tandem with the flexible board to provide greater lift for the user. Because they help divers travel higher and further with greater velocity, these types of boards are best suited for more experienced divers. 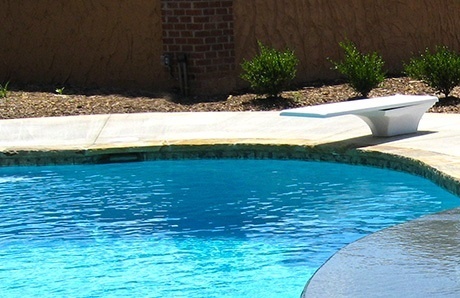 When it comes to jump-board installation, it’s paramount to configure your pool with spacious, deep-end dimensions that safely accommodate big, powerful dives into the water. It can’t be overstated: If you install a jump board, you and your pool guests should take every step to follow safe diving guidelines. Diving boards not only come in a range of shapes, sizes, and springiness, they’re also available in various colors to match your backyard furnishings and décor. Some models of modern boards feature new materials and colors that have a sporty feel that’s easier on bare feet than traditional diving boards. And don’t overlook diving platforms, including jump rocks. 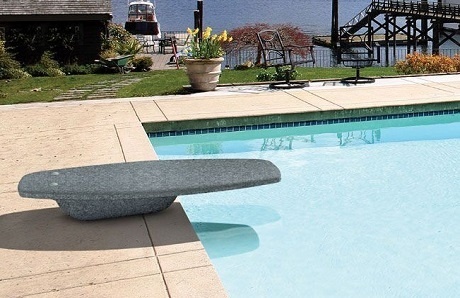 They offer what is arguably the best safety factor among diving board types, and jump rocks also add a stylish accent to your backyard oasis. Yes, diving boards can enhance fun and recreation in your backyard, but the primary consideration must always be safety and professional installation. Be sure to consult carefully with your pool builder about the options that are best suited for your family, backyard, and budget.